U.S. Army Chief of Staff Gen. Raymond Odierno. 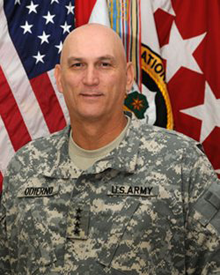 Appointed by President Barack Obama, Gen. Odierno assumed his responsibilities as Chief of Staff on September 7, 2011. Early in 2011, Congress passed the National Defense Authorization Act, which required the defense and service secretaries to review policies "to determine whether changes are needed to ensure that female members have an equitable opportunity to compete and excel in the Armed Forces." Originally, the report was due on April 15, but the Department of Defense requested and received an extension through October, 2011. According to the Army Times, that report had not been delivered as of November 16. The Army Times reports that Gen. Odierno is "not real happy" with the current draft. Certainly there is room for concern about discrimination in the Army. Only 24 of the Army's 403 general officers (6%) are female, even though roughly 15 percent of the force is female. One can speculate that the draft report doesn't fully address the issue, and that the change the Army needs to make isn't fully welcome throughout the institution. If so, some of the factors that make change so difficult might be at work. In time, we'll certainly learn more about what is happening and why the report is delayed. Photo courtesy U.S. Naval War College. When change is hard, we sometimes blame "resistors" — people who refuse to change. We say that they don't "get it" or that they're defending their current advantageous positions, or that they're fearful, or that a few troublemakers misled them. If we don't blame the resistors, we blame the planners of the change. They failed to account for various difficulties, or their plan was defective, or they had a good plan, but they failed to execute it. Sometimes we blame both the planners and the resistors. People have human needs and human desires, and we must deal with people as people. Systems are complex. Our understanding of how they work and how their parts interrelate is probably imperfect. Changing systems sometimes requires following indirect paths. The shortest path isn't always effective. Here are two examples of the application of these principles. Difficulties can sometimes arise from external factors not directly related to the change itself. These factors can seem remote at first, until we actually experience them. For instance, trying to change a process the mastery of which is viewed as essential to high performance can create motivational problems, because people see their expertise as being questioned. The plan to change the process is effective from a process design point of view. And the people who were affected weren't resisting change — they're just applying their own understanding of what the organization values. Unless we deal with external constraints like these, change is hard. deal with people as peoplewe tend to make plans that follow direct paths in process transformation space. But the space in which change actually takes place includes the feelings, knowledge, and attitudes of the people who must adapt. Direct orders to "adapt or else" do not work well at all. People need more than orders to adapt. This is especially true of those whose work depends on knowledge, skill, and relationships. Understanding why we're making a particular change does help, but it isn't enough either. Desire to change — positive desire to adapt — comes about only when people identify with their work and with the organization. A plan to communicate to people what the new regime will be, without seeking their support, isn't defective in itself. As a communication plan, it might be perfectly valid. And the people who choose not to support the changes aren't actually resisting it — they simply don't identify with it. When active support for change is missing, change is hard. Would you like to see your comments posted here? rbrenpBibluVtxuqyhbPgner@ChacJpLpXuMYYNLOGShroCanyon.comSend me your comments by email, or by Web form. I offer email and telephone coaching at both corporate and individual rates. Contact Rick for details at rbrenSLDqSrqQTQSyDSkiner@ChacGwrLfhXSQQNvoQnuoCanyon.com or (650) 787-6475, or toll-free in the continental US at (866) 378-5470.